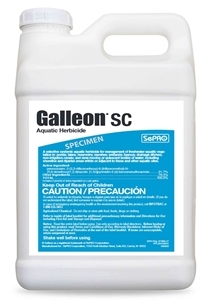 Galleon SC Aquatic Herbicide is a new systemic herbicide for large-scale aquatic plant management. Galleon SC Aquatic Herbicide represents an exciting new technology for management of a variety of submersed, floating, and emergent invasive and nuisance aquatic plants. Galleon SC Aquatic Herbicide is the first acetolactate synthase inhibitor (ALS) fully registered by U.S. EPA for submersed weed control. 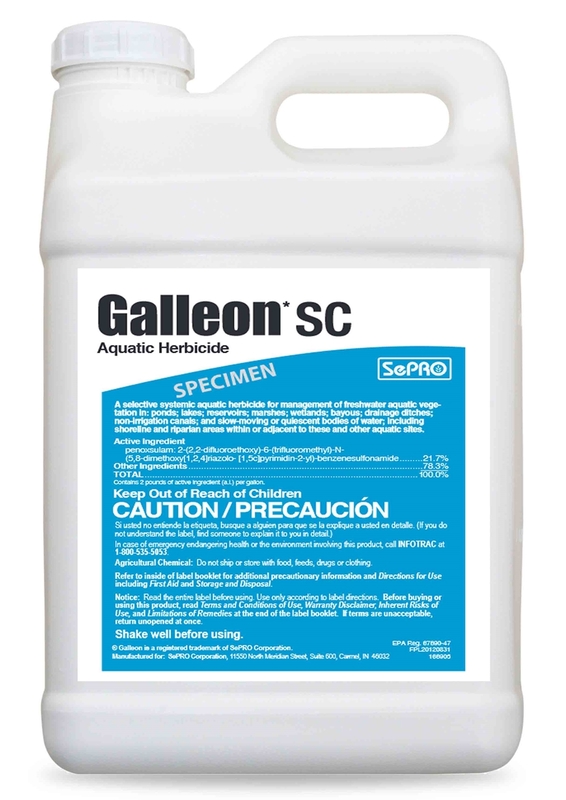 Galleon SC is classified as an EPA Reduced-Risk Aquatic Herbicide based on its use characteristics and toxicology. Galleon SC provides a much-needed, additional systemic mode of action for hydrilla control in integrated control programs designed for improved herbicide resistance management. Targets aquatic weed species: hydrilla, water hyacinth, water lettuce, salvinia species, frog’s bit and duckweed. Direct application to exposed littoral sediment for pre-emergence control following drawdown or other low-water events.